This recipe is a favorite of my family,its easy to do, it gets rave reviews and leftovers make great sandwiches. In a bowl, combine the garlic, sherry, vinegar, honey, soy sauce, dried rosemary, and dried thyme; mix well . Set aside 1/4 cup of marinade. In a large resealable bag put roast and marinade, press out air ad seal, refrigerate for at least 6 hours or overnight,turning occasionally (I do the overnight). remove roast rom marinade; discard bag and mariade. Brush the roast with the Dijon mustard and plae on a roasting rack in alarge roasting pan. Roast or 10 minutes. Reduce oven temperature to 325.F. Continue roasting until a meat thermometer inserted in thickest part registers 150.F for medium, about 1 hour. Place roast on a serving platter; let stand for 10 minutes. Skim fat from pan juices. Place roasting pan over medium heat. Add the reserved marinade; bring to a boil, scraping up brown bits. 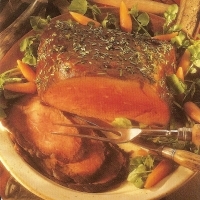 Garnish roast with the fresh herbs and slice roast thinly across grain. Serve with pan juices. This looks awesome, I'm always on the prowl for new beef recipes!!! I love my cow! Thanks for the post!